The dogmatic teaching of the Church has the most intimate connection with the whole moral order of Christian life; it gives to it a true direction. Any kind of departure from the dogmatic Truths leads to an incorrect understanding of the moral duty of the Christian. Faith demands a life corresponds to faith. The Savior has defined the moral duty of man briefly in the two commandments of the Law: the commandment to love God with one's whole heart, soul, mind and understanding: and the commandment to love one's neighbor as oneself. But at the same time the Savior taught that the authentic fulfillment of these commandments is impossible without some degree of self-renunciation, self-sacrifice: it demands struggle. And where does the believer find strength for struggle? He receives it through communion with Christ, through love for Christ which inspires him to "follow after Him." This struggle of following Him Christ called His "yoke": "Take My yoke upon you...For My yoke is easy, and My burden is light" (St. Matthew 11:29-30). He called it also a cross. Long before the day of His crucifixion, the Lord taught: "If any man will come after me, let him deny himself, and take up his cross, and follow Me" (St. Matthew 16:24). "He that taketh not his cross, and followeth after Me, is not worthy of Me" (St. Matthew 10:38). The Orthodox path of the Christian is "the path of the cross and of struggle." In other words, it is the path of patience; of bearing of sorrows, persecutions for the name of Christ, and dangers from the enemies of Christ; of despising the goods of the world for the sake of Christ, of battling against one's passions and lusts. Such a path of following Christ was taken by His Apostles. "I am crucified with Christ" writes the Holy Apostle Paul (Galatians 2:20). "God forbid that I should glory, save in the Cross of our Lord Jesus Christ, by Whom the world is crucified unto me, and I unto the world" (Galatians 6:14). Following the path of Christ, the Holy Apostles finished the struggle of their life with a martyr's death. All believers are called to struggle according to their strength. "They that are Christ's have crucified the flesh with the passions and lusts" (Galatians 5:24). And moral life cannot exist without inward battle, without self-restraint. The Holy Apostle writes: "For many walk, of whom I have told you often, and now tell you even weeping, that they are the enemies of the Cross of Christ; whose end is destruction, whose god is their belly, and whose glory is in their shame, who mind earthly things" (Phil. 3:18-19). The whole history of the Church has been built on struggles: at first the sufferings of the Holy Martyrs in the earliest Christian age; then the self-sacrificing labors of the pillars of the Church, the Hierarchs (Bishops); and then the personal ascetic struggles, spiritual attainments in the battle with the flesh, on the part of the desert dwellers (Holy Fathers and Mothers) and other strugglers--"earthly angels and heavenly men," the righteous ones who have lived in the world without being defiled by the world. And thus up to now Christianity is adorned with confessors and martyrs for faith in Christ. 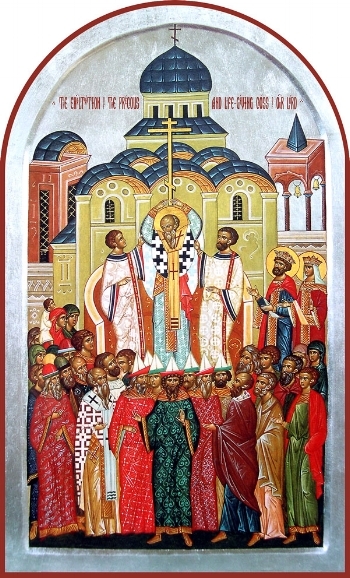 And the Holy Church supports in believers this duty of self-restraint and spiritual cleansing by means of instructions and examples from the Gospel and the whole Sacred Scripture, by the examples of the Saints, by the rules of the Church typicon, by vigils, fasts, and appeals to repentance. Such is the lot not only of each separate Christian but of the Church herself as a whole to be persecuted for the Cross of Christ, as was shown in the visions to the Holy Apostle John the Theologian in the Apocalypse (Revelation). The Church in many periods of her history has endured totally open sorrows and persecutions and the martyr's death of her best servants--what one contemporary priest and Church writer has called the "harvest of God"--while in other periods, even in periods of outward prosperity, she has endured sorrows from inward enemies, from the unworthy manner of life of her members, and in particular of the people who are assigned to serve her. Thus is defined the dogma of the Cross. The Cross is the path of the Christian and the Church. At the same time it is also "the power of the Church." Looking with his mental eyes "unto Jesus the Author and Finisher of our faith" (Hebrews 12:2), the Christian finds spiritual strength in the awareness that after the Lord's death on the Cross there followed the Resurrection; that by the Cross the world has been conquered; that if we die with the Lord we shall reign with Him, and shall rejoice and triumph in the manifestation of His glory" (1 Peter 4:13). Save, O Lord, Thy people and bless Thine inheritance grant Thou unto the faithful victory over adversaries. And by the power of Thy Cross do Thou preserve Thy commonwealth. Thou Who wast raised up on the Cross of Thine own will, O Christ our God, do Thou bestow Thy compassions upon this, Thy new commonwealth named after Thee. Gladden with Thy sovereign might our most Orthodox hierarchs, and vouchsafe them victory over every false teaching; and as Thy help in war may they possess the weapon of peace, the trophy invincible.